The Pilgrims didn't land on Plymouth rock1, yet almost a million people a year visit this site. The Pilgrims did not wear black outfits with buckles on their hats, yet that is what is portrayed in many historical paintings and elementary school Thanksgiving pageants. From the “first thanksgiving,” the foods we eat, the Pilgrims and their activities and dress, Thanksgiving is based heavily on American mythology. To fully understand Thanksgiving, it's important to understand the Pilgrims, on whom this holiday is almost entirely based. The story of the Pilgrims has “grown and evolved over time”2 and one major Pilgrim myth is that they came to America for religious freedom, and religion is a central point of discussion with Thanksgiving. Illustration 1: The present (1920) superstructure designed by McKim, Mead, and White for the Tercentenary of Plymouth Rock. 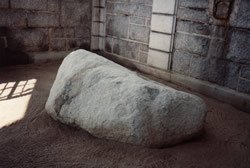 Almost a million people a year visit Plymouth Rock, and yet the Pilgrims did not land on it. The first references to Plymouth Rock are found over 100 years after the actual landing. THERE is a certain tradition which wanders about New England in a lawless kind of way, and which undertakes to account for the origin of our old festival of Thanksgiving. The story runs somewhat as follows: In the early days of the New England settlements, the people somewhere were gathered together to consider the propriety of appointing a day for fasting and prayer, in view of the many sorrows and calamities by which they were then encompassed. One brother, more cheerful-hearted than the rest, ventured to suggest the propriety of counting up the many blessings which had fallen to their lot, and impressed his thought so deeply upon the minds of those present, that they concluded to appoint a day of thanksgiving instead of a day of fasting. From this ancient circumstance we have our modern autumnal festival. This is a view of the origins of Thanksgiving that existed in 1879. The article from which this was taken was written to address the very issue of the origins of Thanksgiving. It is suggested that even in 1879, that the origins of Thanksgiving were more based on stories than on historical facts. In all history, there is an inner circle of facts which are often hard to find. They were so natural and common-place at the time, that no particular record was made of them, and they lie buried in the tomb of forgetfulness. Jennie Brownscombe’s popular interpretation of the First Thanksgiving has become a symbol of the holiday for many Americans. It reached a wide audience and influenced the national understanding when it was printed in Life magazine. Painted during the "Colonial Revival Period," Brownscombe chose some details that are inconsistent with history (such as the log cabin and the Sioux feather headdress) to symbolize early America. The entire image, however, with its elements of religious solemnity, feasting and community has a strong emotional appeal even today and shows a Thanksgiving with which early twentieth century Americans would feel comfortable. Lets compare our understanding of Thanksgiving with that of a modern periodical. This may demonstrate how inadequate our current understanding really is. Here's the first paragraph of an article on Thanksgiving from the children's magazine Highlights, November 2006. Most people think Thanksgiving dinner is incomplete without mashed potatoes, cranberry sauce, and pumpkin pie. It might surprise you to learn that not one of those foods was served during the 1621 celebration we think of as “The First Thanksgiving.” Actually the event itself was not even a Thanksgiving observation. Instead, to the English colonists we now call “Pilgrims,” it was a harvest celebration. This one paragraph addresses a number of issues that are confirmed and reiterated over and over again by many sources and historians. The mythical “first thanksgiving” wasn't a thanksgiving but a harvest festival, the food we eat on thanksgiving has little or nothing to do with the “first thanksgiving” and that the “Pilgrims” weren't even called “Pilgrims”. These are just a few of the myths surrounding Thanksgiving. There was neither cranberry sauce nor pumpkin pie at the 1621 harvest celebration. There were no Indians with woven blankets over their shoulders and large feathered headdresses cascading down their backs. There were no Pilgrims in somber black clothes and tall hats with silver buckles, either. The English didn't even call themselves Pilgrims at the time. That's the myth. The 19th century painters who created these dramatic images were just plain wrong. ... These images have been reproduced in so many schoolrooms and pageants and illustrations that people think they must be true. This painting by Jennie Brownscombe is a typical romantic 19th century image of the English at Plymouth. Such paintings distorted what really happened in 1621. The Pilgrims and their “first thanksgiving” is a key myth that is at the very core of the meaning of the American Thanksgiving Day celebration. The “first thanksgiving” in 1621, was not even the “first” in our country, let alone an actual “thanksgiving”. There are a number of other actual thanksgivings that occurred before this, in the years 1541, 1564, 1607 and 1610.8 This again is evidence that “thanksgiving” wasn't started by the Pilgrims, but came from somewhere else entirely. 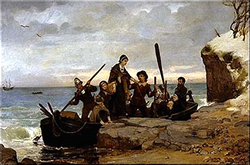 The traditional Thanksgiving Day myth begins with the landing of the Pilgrims and the establishment of the Plymouth colony in Massachusetts in December 1620. Our images of Pilgrims come in large measure from paintings such as the classic and drab painting Pilgrims Going to Church by George H. Boughton, which depicts a dozen somberly men, women and children trudging through the snow shouldering muskets against possible Indian attack. The relationship of the Pilgrims to Thanksgiving Day is a relatively modern phenomenon. Here's a reference to the fact that historical documents that described the actions of the Pilgrims and their “first thanksgiving” were not even discovered until after thanksgiving celebrations had long been a part of the American culture. Although the only known contemporary account of the 1621 Plymouth harvest celebration had been rediscovered in 1841, the national Thanksgiving Day initially was not officially linked to it. In 1691 Plymouth Colony was annexed into Massachusetts Bay Colony. The Massachusetts Bay colony was for all intents and purposes, a theocracy run by Puritans. Puritans did not desire to separate themselves from the Church of England, but simply wanted to “purify” it, hence the name “puritans”. The Pilgrims played a small roll in the development of New England culture and Thanksgiving. Turning now to the Colony of the Massachusetts Bay, it is well to bear in mind, that in the early years, the people there did not intend to copy after the Plymouth people. They “were a law unto themselves,” and had very little fancy for doing any thing, simply because those poor Pilgrims had done it. After the settlements began in strength, in 1630, it was quite common with the Puritans of the Bay to appoint thanksgiving days for various reasons. 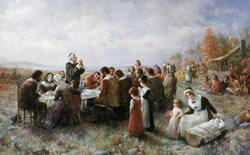 The Puritans of Massachusetts Bay Colony had frequent recorded thanksgivings starting as soon as the colony was formed in 1630. Then again in 1631, 1632, 1633, 1637,1638. This clearly indicates that one of the true origins of Thanksgiving is directly from England via the religious traditions of the Puritans. These Puritans were adamant that they were not separating from the Church of England as the Separatist Pilgrims had. Therefore it can be concluded that these many days of thanksgiving in Massachusetts Bay Colony were directly influenced by their religious base, the Church of England. These statements indicate that the Separatists were concerned about the religious purity of the Church of England and even called it “Rome”. So when and how were the Separatist Pilgrims linked to Thanksgiving Day? There were isolated references to the Pilgrims’ First Thanksgiving after 1841, but none of any significance. A survey of standard primary school textbooks from 1900 to 1940 shows that references to the Pilgrims often omitted any mention of the 1621 Thanksgiving. Nevertheless, there was sufficient awareness of the 1621 myth among the American public to prepare the nation for a widespread acceptance of the “First Thanksgiving” by World War Two. Sarah Hale, Thanksgiving Day's most active proponent of the festival in the 19th century, rarely mentioned the Pilgrims in her campaign to create the national holiday, and only near the end of her campaign. In fact, Mrs. Hale accredited the origins of Thanksgiving in America to Boston and the Puritans, not the Pilgrims. 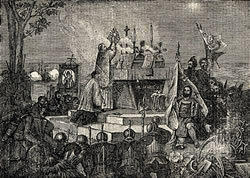 Illustration 7: An engraving depicts the first Catholic Mass held in St. Augustine on Sept. 8, 1565. Some historians consider this to be the first actual thanksgiving in America. It wasn't until the latter half of the nineteenth century that our nations leaders trained their nostalgia on the “first” American Thanksgiving. The spirit of that shared, multicultural feast in 1621 provided an ideal symbol of America's new self-image as a melting pot. Historians have traced the connection of the Pilgrims to Thanksgiving Day to the middle of the 18th century when old documents were discovered in England that detailed the early lives of the Pilgrims. Here is a quote from an article printed in 1866 that details the origins of Thanksgiving. It demonstrates how new the idea of a Pilgrims' “first thanksgiving” really was. The real Pilgrim “first thanksgiving” happened two years after the myth based “first thanksgiving” of 1621. The Pilgrims actually described the event in 1623 as a “day of thanksgiving”11, but not the event in 1621. There are only four recorded events of the Pilgrims that could be classified as “thanksgivings”; the event of July 1623 was the first, the next were October 29th 1668, June 7th, October 20th and November 26th 1690. After this Plymouth colony combined with Massachusetts Bay colony. In the same article from the Christian Recorder, written in 1866, another point of origin for Thanksgiving Day is cited. A thanksgiving on February 22nd 1631 in the Massachusetts Bay Colony in which a day of fasting was turned into a day of thanksgiving because of similar circumstances to the Pilgrim's 1623 thanksgiving. The colony was low on food when a ship came into port with food from Ireland bringing supplies. Another thanksgiving on October 16th 1633 was the first that was observed throughout all the colonies. Thanksgiving was annually declared in Connecticut in 1643 and every year since until now, breaking this tradition only one year. The colony in Connecticut is given quite a bit of credit for creating the real roots for an annual thanksgiving day. It's important to understand that days of thanksgiving were not annual events to the Puritans and Pilgrims, they were called any time of the year in response to divine intervention. Even President Lincoln proclaimed two thanksgivings in 1863, one is the famous “last Thursday of November” that started our modern traditional timing, (by an appeal from Sarah Hale) the other was on August 6th. The article in the Christian Recorder in 1866 was titled “Origins of Thanksgiving”. It contradicts the idea that the Pilgrim's first “thanksgiving” in 1621 is the origin of Thanksgiving Day. Historians agree with this general assessment as well. The Pilgrims and their 1621 "First Thanksgiving" were only solidly cemmented with the history of Thanksgiving in the 20th century. By the post-World War II period, Thanksgiving was the primary focus of the Pilgrim story in popular culture. The association of the popular holiday with its supposed Pilgrim origin had become a self-evident historical truth – the world had been sold on the “Pilgrim” brand of Thanksgiving. The historical evidence shows that the the acts and the beliefs of the Pilgrims have had very little, if anything, to do with the origins of Thanksgiving Day. So what is Thanksgiving Day without a “first thanksgiving”? 10http://www.pilgrimhall.org/ThanxProc.htm Every Thanksgiving proclamation made by a US President.